Last weekend I was invited to an ugly sweater Christmas party, and to get inspiration for my costume, I decided to watch a film featuring the ugliest of Christmas sweaters, Bridget Jones’s Diary (DVD/Download). 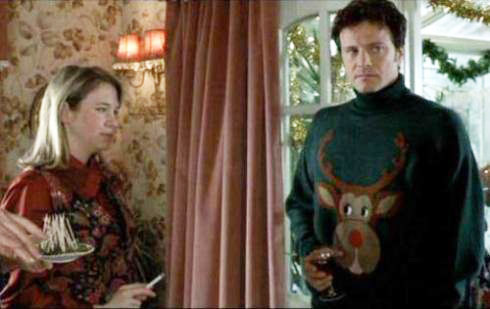 While Bridget Jones isn’t totally a Christmas movie throughout, it does feature Colin Firth in some very festive holiday sweaters and ties. Plus, a movie starring Colin Firth AND Hugh Grant- well, Merry Christmas to me! Bridget Jones’s Diary was adapted from the entertaining book by Helen Fielding, which loosely borrows the plot from Jane Austen’s Pride and Prejudice. This was the novel that launched a thousand Chick Lit ships (my own book included), wherein smart but insecure 30-something women live in a city, date inappropriate men, go out drinking with their friends, have fabulous careers, and worry about dieting and finally finding “the one”. I have to say, this is one of the better books (and films) in the genre, and although there was a great deal of outcry over American Renee Zellweger playing beloved Londoner Bridget Jones, I think she did a great job. Plus, she’s never looked better than she did in this film, causing me to wonder what other stick-figure actresses would look like with a little meat on their bones. Probably, greatly improved. One of my favorite scenes in the film is when Colin Firth and Hugh Grant get into a fist fight outside Bridget’s apartment. Thus my cocktail this week is inspired by Colin Firth’s fists-o-fury, and is a great addition to any holiday party. While watching Bridget Jones’s Diary, I recommend drinking Darcy’s Milk Punch. 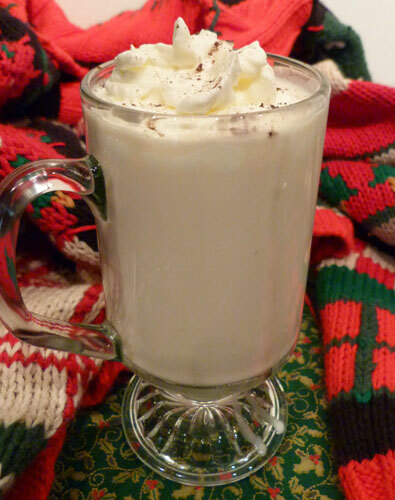 Combine brandy, rum, simple syrup, milk, and vanilla extract in a glass with ice. Stir to combine, and top with whipped cream and nutmeg. I love to watch this movie around the holidays because, like Bridget, it’s around this time of year that I tend to take stock of my life and figure out what my resolutions should be for the New Year. Like her, my list usually includes dropping a few pounds and cutting back on alcohol units. At least I don’t have to worry about pressure to find a nice, sensible boyfriend- I already have a nice, sensible husband to sport that tacky Christmas tie I’m making him wear. Cheers! Posted in Comedies, Holiday Films and tagged Bridget Jones's Diary, Colin Firth, Darcy, Hugh Grant, Jane Austin, Milk Punch, Pride and Prejudice, Renee Zellweger, ugly sweater Christmas party. Bookmark the permalink.